Specially blended for us by a local spice company using only the highest quality ingredients. Add a 14.5 oz can of petite diced tomatoes to 2-3 Tablespoons of this dry mix. For more flavor add a can of Ro*Tel Diced Tomatoes and Green Chilie. Allow to sit for 5 minutes and dig in with some chips or top those tacos and burritos !! Many Chili cooks add this to give their Chili a little KICK !! accent for vegetables and salads !! Give a kick to the taste of whatever you've got . . . It's not too mild and it's not too hot . . . Tap into the taste of Tapatío. Tapatío Hot Sauce adds a kick to whatever you're craving! The special recipe enhances but never overpowers . . .
With the perfect balance between mild and wild! So Tap into the taste of Tapatío! Not incredibly hot; but it is very tangy and flavorful. Add to any foods, even try it in your orange juice and on popcorn !! A classic Mexican sauce with a unique flavor from the Pequin peppers. Made from Red pepper, Pequin peppers, spices and vinegar. It’s the bottle with the wooden top !! The # 1 Salsa in Mexico. Use this red salsa right out of the can. For dipping, and great on top of eggs, steaks, seafoood, etc !! Use this green salsa right out of the can. Use to top chicken enchiladas with sour cream. dip for chips, add to meatloaf, just endless uses. Peppers in Adobo Sauce (vinegar & tomato) . 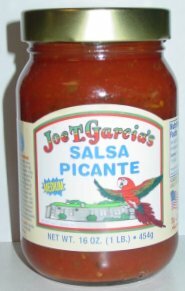 of the best Salsa's to ever come out of Texas. Copyright 1998-2016"Secrets to Cooking Tex-Mex/Michael W. Ludwig. All rights reserved.